Celebrate your Independence from Cable or little Dish! THIS SALE HAS ENDED Thank You all who purchased at our sale price. 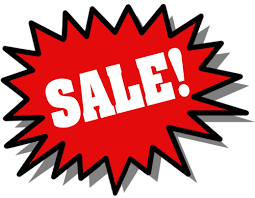 Posted on June 29, 2015 July 6, 2015 Author rainiergroupCategories Rainier NewsLeave a comment on JULY 4TH SALE!! 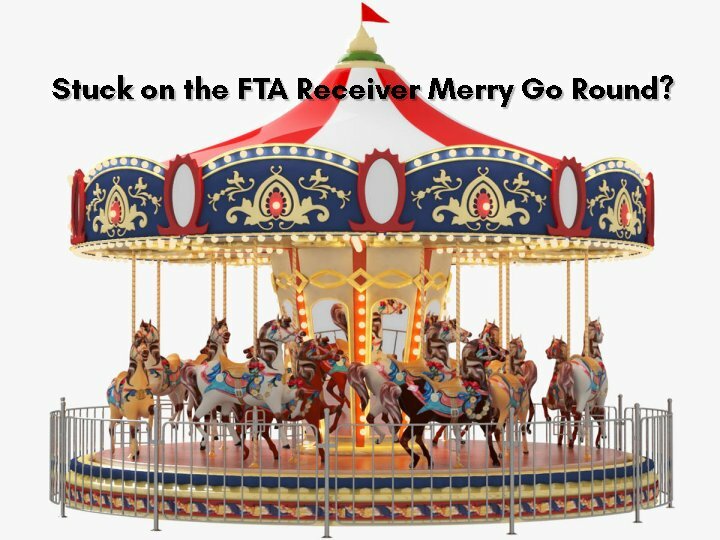 Are you stuck on the FTA Receiver Merry Go Round? Do you end up buying the latest FTA receiver every time you turn around being promised by that FTA dealer is it will work without performance issues (such as video audio stutter and lag) ? Promised the firmware update to fix problems is coming and never does? Then end up with another box that does not deliver what they promised, only to do it over and over again? These dime a dozen FTA boxes are nothing more than a China or other country built foreign models designed to work in that country, NOT in the USA. No matter how you try to manipulate the firmware it just will not work right in the US with our signals. The Rainier Cisco D9865 is designed for the USA and the broadcast signal over here in North America. It has the processor power and firmware from the factory to do it right the first time. Its time the facts are known to the public. You work hard for your money, and its time your hard earned money is spent on something that works. Only the Cisco / Rainier D9865 receiver plays ALL FTA without issues. Its works out of the box without upgrades or firmware modifications. 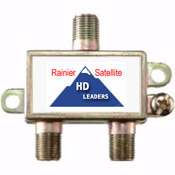 Only the Rainier receiver can provide Subscription C band HDTV and FTA that works ALL in one box. You can log in as a guest to view the discussion in its entirety. Click on the MPEG2/DVB forum from the directory then login as a guest. 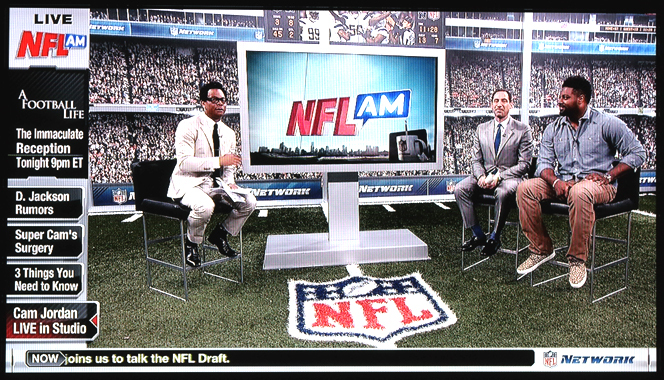 I Did Side by Side comparison between Time Warner cable Using two Panasonic Plasma HDTV set using HDMI. Tested Component Output on a Glass CRT and LCD HDTV Set and Picture Quality is Excellent, Even the NTSC Composite video output top notch when compared to lousy Time Warner Cable bit starved HDLite. I also compared to an PANSAT AZBox and other commercial receiver and the picture was good or better as anything I have. Audio is present on the HDMI output and the Coaxial SPDIF sounds great High Fidelity no hum or noise when used with either a Yamaha 8.2 or Panasonic 7.1 Home Surround Sound Theater audio Receiver. The Cisco receiver has been completely trouble free on the initial install does everything the specification says it will do. It even play NBC and other High bit rate feed with NO STUTTER. It runs very cool to the touch no noisy fan is required. There are no USB or Ethernet ports as it does not need any Firmware update as its bug free right out of the box. Any firmware updated for new operational features will done by download from the satellite. This means no more Bricked STBs that are turned into a doorstop when file transfers are gone bad with PC or USB Thumb drive. First screen is the Tuning parameter that were already entered show if there is a signal look Signal Quality Signal level. Next press OK and the first number will turn black and you can change this number either using the up down arrow of Direct enter the number using the remote numerical keys on the remote press OK Then press the down arrow once then OK to Preset the name of the new programing service. Next Scroll down to symbol rate click OK and enter the the number then click OK again. Finally press the down arrow again Click OK and enter the NETid. NetId for the FTA service can be found on Lyngsat oe will be provided by Rainier when new progaming services are available. Once everything is entered correctly Position the dish on the satellite and polarity of the service you want to manuallly scan in Press the BLUE button to ACTIVATE which scans that transponder in. You get a warning Changes may affect system settings but do not worry Press OK If your on the right satellite and polarity you will see Acguistion Successfull or Acquisition Failed. If it failed check the dish position and Polarity setting on your slaved receiver as DVBS2 polarity position has to be dead right on and are touchy as with any other brand FTA STB. IF your all thumbs in manually programing a STB Rainier will preprogram them for you for a fee to cover time and shipping charges. You should learn how to manually program the Cisco so you can DIY yourself when new programing become available. Once your locked email Rainier your Name and Address with the S/N and UA (unit address) and they will forwarded this to Cisco. It may take a day a two before Cisco enters the UA and authorizing the programinging depending how busy they are. They should get faster as the volume of people wanting Authorization goes down. SO Be Patient! Its been worth the wait. 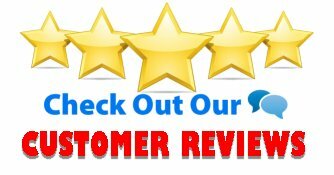 I also emailed customer service to ask numerous questions about the other menus and features not in the user manual… They were very quick to call me back and were very knowledgeable to help me and any other problem you may have to solve. They took the time to explain to me anything I wanted to know. They have 5 year contracts and Rainier told me they will be in it for the long haul to get more programing as they have signed contracts already for more programing. As you can tell I EXTREMELY HAPPY with my purchase it reminded me how I felt the first time I set up my satellite system back in 1978. It may seem old hat but the ear to ear smile on my face watching MAVTV without any artifact and then calling Time Warner and telling them you can stop charging extra money for MAVTV so remove the service and the extra charge from my cable bill. Posted on June 25, 2015 November 17, 2017 Author rainiergroupCategories Rainier NewsTags 4DTV, 4DTV Shutdown, C Band HDTV, C band programming, c band provider, C band Satellite Dish, cable tv, directv, dish network, fta, gofastmotorsports, HyperMegaSat, powervu, programming center, rainier satellite, Ricks Satellite, Satellite Guys, satellite programming, Satforums, skyexpress, Skyvision, SRL, Titanium Satellite, TVROSATLeave a comment on Are you stuck on the FTA Receiver Merry Go Round? Universal IR to UHF Remote Kit and Second transmitter is now available at the Rainier Webstore. Works with the D9865 and other devices. Order Today! Time to step up to easy trouble free operation for your C band system. Rainier’s webstore is carrying the Core Reception Electronics Package. And the proper H / V switch needed to connect up to the Cisco Rainier D9865 Receiver. Simplify your operation. Get rid of the clunky 4DTV or Analog Mover with Servo control. 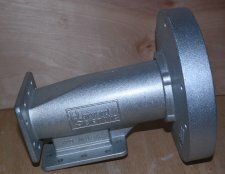 No more servo motors to burn out or freeze up. 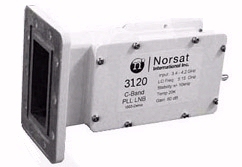 Commercial quality PLL LNB’s assure the ultimate signal reception. Move your dish… change channels on the D9865… couldn’t get simpler. 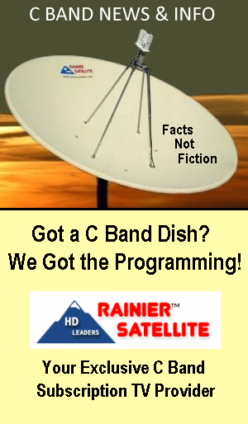 Rainier Satellite utilizes the c band satellite spectrum using the large dishes (not the little dishes) You will need a c band dish set up at your location. or call 509 486-4137 for more information. If you already have a c band dish and 4DTV receiver or older analog receiver in working order you’re almost there. You will need to purchase the Rainier Satellite Cisco Receiver and programming from our webstore. Shop Now! Once authorized enjoy the best HD programming quality available hands down! Rainier’s Basic HD Package is only $10.83 a month. There is never an Extra HD Charge with Rainier like with the other providers. Posted on June 19, 2015 June 19, 2015 Author rainiergroupCategories Rainier NewsLeave a comment on Did You Know? 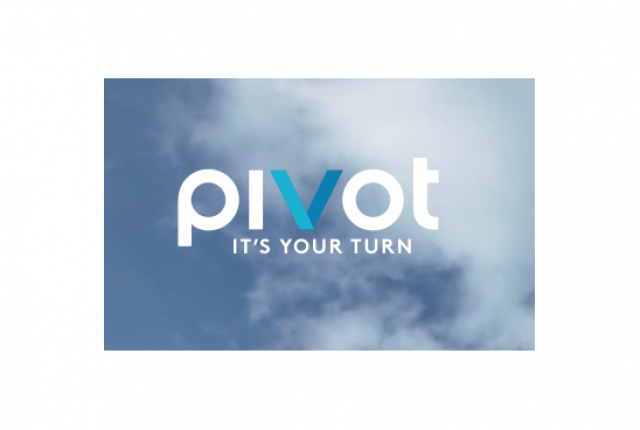 Are You Tired Of Your Poor TV Provider Yet? 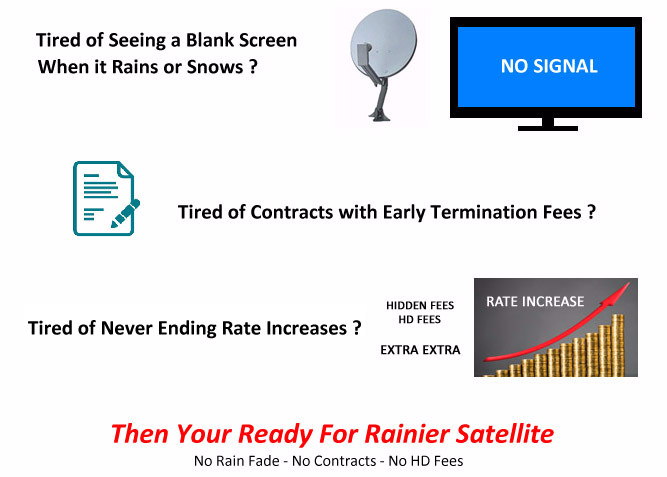 Get Rainier Satellite and be done with all the others nonsense your forced to put up with. Posted on June 18, 2015 June 19, 2015 Author rainiergroupCategories Rainier NewsLeave a comment on Are You Tired Of Your Poor TV Provider Yet? Pivot TV in Pure HD has been added to Rainier’s Basic Lineup. It will be launching soon for all subscribers.